Are we becoming indifferent to freedom and democracy? I know, I know: That title sounds ridiculously click-baity. But if you'll look at my blog, you'll see that I don't really go in for click-bait titles. Unfortunately, I mean it quite literally. It's an enormous problem that we aren't talking about enough. And I want to propose that one reason for it is a massive failure of civics education. Support for democracy is declining. First, let's talk a bit about support for democracy—yes, democracy itself, as in voting for your leaders and representatives and holding them accountable in the arena of public debate. Only one in five Millennials aged 18 through 29 cast a ballot in the 2014 elections—the lowest youth voter turnout in 40 years, says the Atlantic. As Vox recently asked, "Are Americans losing faith in democracy?" The article makes a series of points illustrating that Americans, especially younger Americans, are ignorant of and aren't engaging in American political life. The article's main source is a forthcoming paper by Roberto Foa and Yascha Mounk titled "The Democratic Disconnect," together with the World Values Survey. The writers summarized their own work in the New York Times last September. Asked how much interest they have in politics (as Vox reports), Americans born in the 1930s said "very interested" or "somewhat interested" almost 80% of the time; for those born in the 1970s, the figure dropped to about 50%, and for those born in the 1980s, it was continuing to drop just as precipitously. More sobering is the survey question about how essential it is to live in a democracy, rated from 1 to 10. The percentage of Americans responding "10," essential, has dropped from the 70% range for those born in 1930 down to the 30% range for those born in the 1980s. A 40% drop in support for democracy itself is a momentous generational change. In case you think that's a mistake, compare that to a question asking whether "having a democratic political system" was a "bad" or "very bad" way to run the U.S.: while the percentage for those born in the 1950s and 60s hovered around 13%, for those born after 1970, in the surveys since 1995, the percentage rose from about 16% to over 20%. Even openness to army rule—something we associate with banana republics—has climbed from 7% to 16% of all Americans. Support for free speech in America is declining. This is incredibly important: the Pew Research Center found that 40% of American Millennials are OK with limiting speech offensive to minorities (up from 12% for seniors aged 70-87). A stunning 51% of Democrats want to make "hate speech" a criminal offense, and 37% of Republicans. If you have even a passing familiarity with First Amendment law, you'll know that these things are contrary to the First Amendment. What the video shows notwithstanding, Yalies are very smart. They can compare their attitudes toward offensive and hate speech with what they learned in their elite civics and history classes about the First Amendment, and infer that they're opposed to the First Amendment. If they're reasonably intelligent, self-aware, and honest with themselves, as some Yalies are, they'll recognize that their intolerance to certain kinds of speech commits them to an opposition to free speech. The increasing hostility toward free speech among many of our future leaders at elite colleges like Yale has been frightening to many of us, and has sparked a national conversation—an example is here, summarizing some recent episodes and calling academe to return to free speech. Here's a possible reason why: Civics education has been weak for years and recently declining even further. I don't pretend to know why support for democracy and free speech have been declining, but if our students for some generations have simply not been well educated about basic American civics, that must be part of the explanation. [T]he Civics Education Initiative...requires high school students, as a condition of graduation, take and pass a test based on questions from the United States Customs and Immigrations Services (USCIS) citizenship civics exam – the same test all new immigrants must take to become U.S. citizens. To date, six states...have passed legislation implementing the Civics Education Initiative, with a goal of passage in all 50 states by September 17, 2017 – the 230th anniversary of the signing of the Constitution. But, you wonder, if new immigrants have to pass this citizenship civics exam to get in the country, wouldn't American high schoolers be able to pass it? No. In studies, only 4% of high schoolers in Oklahoma and Arizona passed it. The National Council for the Social Studies published a position statement summarizing the sobering truth: "Sadly, the narrowing of the curriculum that has occurred over the past several years combined with the scarce attention to civic learning in a number of state standards and assessment measures has had a devastating effect on schools' ability to provide high quality civic education to all students." beyond mere voting, a college degree does not encourage graduates to become actively engaged in more consequential aspects of the political process. Said another way, among persons with equal civic knowledge, those having earned a bachelors degree do not demonstrate any systematic and added political engagement beyond voting. ... A college degree appears to have the same negligible participatory impact as frequently listening to music, watching prime-time television, utilizing social networking sites, and emailing. Knowledge of basic political facts among the general public is shockingly low. For example, only 40% of Americans surveyed in a recent survey by Pew knew which party controlled each house of Congress, and only about a third of Americans could even name the three branches of government. Civics isn't easy, and political philosophy is even harder. But both are necessary. If this purported decline of commitment to the basic American system is real, and if it's rooted in poor civics education, it doesn't seem surprising to me. For all the emphasis on reading and the massive, feature-rich language arts textbooks, American public school students don't have to read many books, period. Most of them are not prepared to read and comprehend the Constitution, much less the complex historical works such as The Federalist Papers, Common Sense, and Democracy in America that explain and defend the American system. Education matters. It is likely that we will face more battles in higher education and, increasingly, in the public sphere over the necessity and advisability of maintaining robust democratic institutions and adherence to free speech. I fear that as we answer more and more attacks, reference to the Constitution and American political principles will not be sufficient. Part of the problem can be laid at Jefferson's doorstep, when he wrote, "We hold these truths to be self-evident." The fact is that they aren't self-evident, that philosophers have argued for and against them quite a bit, and in the years ahead, the better the pro-freedom side acquaints itself with those arguments, the better chance we'll have. After my wife told me I sat too much, and reading various scary things about the evils of sitting too much and the benefits of standing desks, I decided to try out a standing desk. At first I was going to order one or buy one locally, and then I looked at the prices and decided that I'd better try it out before I invest. To try it out, I built one to put on top of this old desk. The desktop was already pretty much the size I wanted, about 2/3", at Home Depot. The other boards (same width) were cut at the store for me to my design. Then I just got some wood screws and put it together. (Note to self: get a better drill.) It turns out to be quite sturdy. Of course, I had to carefully measure for the exact right height, and I did a very good job there on getting the height exactly right for me. Now, when you get a standing desk, there is a breaking-in period (so I read, and so I am confirming right now) in which your feet and legs won't be able to handle standing all the time, or not without some distracting pain. So to begin with, at least, it's a good idea to have chair. But it has to be a tall chair. At first, I used a counter stool from downstairs, but that didn't work because it wasn't tall enough (I need a 30" to reach my desktop height comfortably; a taller person might need a slightly taller stool). So I got an adjustable barstool, as you can see here, and it works fine. Another thing that makes the standing desk more tolerable is a soft, but not too soft, floor. At first I thought I could just stand in my shoes. I discovered that my shoes are not very comfortable for standing in for long periods of time. Just standing on the carpet, although it is a somewhat plush carpet, was also a no-go. So I decided that all the standing desk blogs were right and that I needed a special mat, an "anti-fatigue" mat, that would be easier on my feet. So for $40 I got a kitchen "chef mat" and put a couple of memory foam bath mats on top of those. They help, but I'm still trying to decide what is best. Generally I put the two bath mats on top of each other then on top of the chef mat, and then shift positions as different parts of the foam get compressed. I suspect that I should probably spend the $75+ and get a gel mat. Finally, for the piece de la resistance, I have a little stool to rest my foot on. This is another commonly-recommended accessory of standing desks. At first I didn't think it would be that necessary, but as it's necessary to shift one's position pretty frequently, it's just nice to have another position to put my legs in. It also helps, by the way, to shift my feet back a few inches as necessary, to keep the weight more on the balls of my feet than on my heels. But if they all just start getting too sore, I just switch to the stool for a little bit. It's not that bad. Total cost, including $25 wood and screws, $80 stool, and $40 mats: $145. 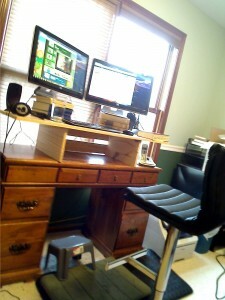 Wife no longer nagging me about sitting too much: priceless. I think the most relevant cause of the Sandy Hook Elementary shooting has relatively little do with guns or mental health. I think it's because our society is seriously ill--not mentally, but morally--and many of us are in denial about it. We rarely talk unironically about honor, morality, or shame, or otherwise give signs that we take seriously an objective morality and a commitment to freedom and personal responsibility. Our society's elites simply don't think that way anymore, preferring to think of incidents like this as sociological phenomena with collective solutions, rather than individual/ethical issues with individual solutions. The very tendency we have to ignore issues of personal responsibility and morality, to regard events like this as merely pathological and not under anyone's control, allows people to feel free to act without conscience. It's as if they say, "What I do is not under my control. I've had it, I've snapped, I can't stop myself..." and then they proceed to act out as if they really couldn't stop themselves and there's no need to. Guns are not going to be banned. More mental health care will not stop people from acting out. The only solution to this sort of thing, in this country, is to reinvigorate our sense of personal responsibility, and to shut down the idiots who say we have no free will, who think that there are no problems for individual morality but only for psychology and sociology. My enjoyable time with the group behind WatchKnowLearn.org and ReadingBear.org is winding down, and soon it will be over. My benefactor of the last four years has kindly given me some time to finish up my remaining work and find something else to do. As much as I enjoyed developing WatchKnowLearn and Reading Bear, and as much good as I think those websites will do for kids, it is always nice to start something new. I'm a serial starter; it's a process I enjoy. Making my situation even more interesting is that this will be the first time since 2002 that I don't have something lined up. Back in 2002, I was another unemployed Ph.D. philosopher. Now, I can put on my resume that I am a founder of Wikipedia, Citizendium, WatchKnowLearn, and Reading Bear. So, naturally, I'm very curious what's available to me. I thought I would put the question out to you, readers of this blog. What should I do next? And, of course, please spread the word that I'm available and looking! I have far more ideas about things I'd like to do than I have time to pursue them. I just don't know which one I would love the most, or which is most likely to work out. I'll put these roughly in order of my excitement level, although all of these are exciting to me. I'm sure I'm leaving out 3-4 ideas that I'm just not thinking of right now. 1. Textop! I've been dreaming about this since 2006. Imagine taking the Great Books of philosophy, history, law, and so forth, cutting them into paragraph-sized chunks, describing the chunks, and then organizing them in an outline of ever-increasing detail and depth. That is the core idea. It sounds very wonkish and scholarly, and I suppose it is, but I believe this idea will prove to be deeply revolutionary; I think few people understand just how much so. It has the potential to change the nature of scholarship, research, education, and ultimately everything forever. It would be more revolutionary than Wikipedia. It would be a brand new kind of reference work. It's a project I really want to work on, more than any other. I've thought of approaching various reference publishers, universities, tech companies, etc., but I suspect it will be a hard sell. 2. Policy Analyst or Writer for education or ed tech thinktank/nonprofit. I've long wanted to try this. I almost got into it in the 1990s. Education is a long-standing interest of mine, and I do enjoy writing about it, as any reader of this blog knows very well. I'd love to write a book titled Why Knowledge Is Important, defend homeschooling against hare-brained attacks, and go to the mat for back-to-basics curriculum married to the liberal arts as well as for vouchers and school choice. Basically, I think education is easily one of the most important institutions in society, and I want to enter the marketplace of ideas and improve it. 3. Crowdsourcing spaced repetition. Having used SuperMemo for the last five months with my 6-year-old, I've got some ideas about how to bring spaced repetition into individual classrooms and schools and thus into the big time. One thing that needs to happen is that we need to start working together on making the best sets of questions for common texts. Memorizing random, contextless information in the form of stacks of flashcards is tiresome. Memorizing information that you have already properly learned, by reading well-written books, is where it's at, I think. I haven't thought so much about this one, but it is certainly a problem I'd be interested in working on. 4. A filtered version of Wikipedia. No, not Citizendium redux. It would be involve me, a filtering company, and possibly another party or other parties. The main feature would be that Wikipedia's pages are displayed in up-to-the-minute versions, with images cleverly removed within the page rather than blocking whole pages. One company demonstrated to me how this might be done. I was quite impressed. In addition, we can use a "filtered Wikipedia" website to gather professional feedback on Wikipedia articles and, perhaps, fork selected articles once there is enough interest in doing so. Such a website would be a version of Wikipedia that would be recommendable to school districts and so would constitute a natural source of traffic and revenue. The Wikipedia community and the WMF have really fallen down on the job in developing Wikipedia to its potential. Providing to the world an up-to-the-minute version of Wikipedia with features that that community refuses to add, on principle, is personally my best hope of making Wikipedia into something that I really can get behind and be proud of. 5. Children's philosophy books. I don't think it would take me very long to write a general introduction to philosophy for children, and another general explanation of ethics for children. In fact, I have worked on the beginnings of these books, off and on, for a while. I don't think I'll ever finish them properly without lots of free time (which I don't have), and I think the world needs them. Adolescents, especially, need a clear explanation of what is right and wrong, and why we should be moral. I think I can explain it to them. This is important work, and it makes me sad that I don't have an opportunity to do it (while, of course, supporting my own family). 6. A news wiki/a crowdsourced news summary/opinion project. One of the things that, early on, we discovered that Wikipedia does very well is to aggregate news reports into a massive summary of a sort that ordinary news outfits are not capable of developing. This is why Google links to Wikipedia's articles about events in the news: they just lay everything out. I've been approached by one veteran journalist and, separately, the journalism department of a major southern university to develop a crowdsourced journalism site. Since I was otherwise occupied at the time, I had to pass in both cases. But I wouldn't rule that one out. I think the world needs a more even-handed news source, one in which biases are explicitly acknowledged. I've got ideas about how to do it (of course)... Another, related idea is an opinion wiki, in which people collaborate on, not factual articles, but arguments, position statements, etc., about everything. This has been attempted, but not in a way that attracts a lot of eyeballs. I've got ideas about how to do this sort of thing right, too. 7. Facebook for traditional tunes (a little like this site). Each has its own page. Users can submit versions in ABC format, which are displayed in sheet music form and voted on by other users, and the top vote-getter is displayed at the top of the page; they can also submit recordings and videos (of themselves or their bands). They can also "teach" the tune via a different set of videos. There are other features. I was approached by one of Ireland's top fiddlers about starting an Irish trad website, but I to my ever-lasting regret had to turn him down because I was heavily into Citizendium and WatchKnowLearn at the time. Of course, now, there should be a big app component of the site, I imagine. TheSession.org does a good job of this, by the way...but lacks a lot of the features I'd like to see. It is easy to imagine that, with the right level of funding and partnerships with, say, the Irish Traditional Music Archive and the Traditional Tune Archive, this could become an essential resource for traditional music. Anyway, something like this should exist and I'm kind of surprised that it doesn't yet. There's no reason it would have to be limited to Irish traditional music, too. You can imagine similar sites for similar styles, and instruments (think bluegrass, solo piano, and cover bands). Editor/Project Manager for reference or education publisher. Director of Innovation for any of a number of different kinds of company, but I guess reference, ed tech, and social media would be most in line with my background. Project Manager for the same. Professor, probably in a Communications or Computer Science department--maybe a Philosophy department--focusing on theory of technology. Public Speaking on topics I'm knowledgeable about.